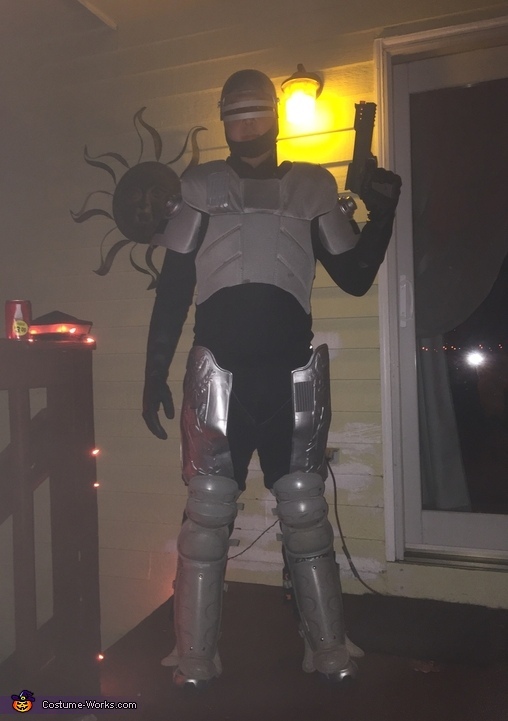 For my friend's party this year I decided to go with one of ky all time favorite movies, the 1987 futuristic classic Robocop. First thing I did was target a top part that could simulate Robo's upper torso so I went to Play it Again Sports and picked up a hockey chest protector and wore it backwards. For the helmet I spray painted a plastic swat team top I picked up at Savers. I wore a black open skull cap to cover my head and even painted a silver bullet to replicate where Alex Murphy was shot. The visor were red sunglasses with glued on cut out strips of metallic gray paper from Michael's to make it look more authentic. The thigh hip parts were actually plastic pieces of Roman Gladiator armor from a Halloween shop spray painted in silver. I had black plumbing gloves I bought at a discount dept. store. The signature gun was actually a generic kids variation that made noise and everything, picked up on ebay. I used a black under armor shirt and black slacks I wear for work as the laying under the metal. Random pieces of tv equipment and dollar store wallets were adhesived to the upper part. The legs were baseball catcher's knee pads, also from Play it again sports. It was alot of fun!